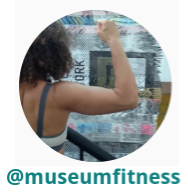 To celebrate the confluence between these passions, some buddies and I have started an instagram account called @museumfitness. We are posting short museum-based exercise videos each week. I invite you to follow the account, send in your own videos (tagged #museumfitness), and sweat along with us at your institution. While it's a silly project, #museumfitness is also a small attempt to break down unproductive divisions between "art people" and "sports people." Pop culture often tells us that intellect and sports don't mix. Some of my museum friends seem viscerally uncomfortable with athletics. Some of my fitness friends would never set foot in a museum. I believe that smarts and sports DO mix... and at least for me, they enhance each other. I've been a nerd my whole life, and a jock since high school. When I was 14, I joined the water polo team. I spent every morning and evening in the pool. I loved it--the hard work, the yelling coach, sweat in my eyes and chlorine in my hair. I felt like part of something challenging and communal. After high school, I stopped playing high-level sports but kept building my passion for social sweat. I boxed. Played ultimate frisbee. Climbed rocks. Played beach volleyball. Right now, when I'm not at work, I'm training for obstacle course races with a local team. For me, sports are a way to push myself and to connect with people who are different from me--both skills that enhance my work as well. I love challenges. Challenges at work can be messy and interpersonal. Challenges in athletics are simpler. Cleaner. How far can I run? How hard can I push myself? I can dig deep when I want to, and if I decide to quit, I'm not letting someone else down. When I challenge myself in sports, I train myself to be tougher in a low-stakes environment. That helps me confront challenges at work--which often come with emotional or political stakes--more confidently. I love building social bridges. My museum focuses on it, and I really believe that building bridges across differences can build a better world. I get to practice bridging in my personal life through sports. My fitness friends come from all walks of life. They are more diverse than my colleagues economically and politically. Despite our differences, we trust each other and support each other. We work together to achieve impossible, trivial heights. For no obvious reason, we have quite a few #museumfitness fanatics at the MAH. I love working with people who know how to push themselves beyond their comfort zones. I love working with people who aren't afraid to shoot for a big goal. I love working with people who are ready to dive in and support each other so we can reach that goal. I learned a lot of these lessons playing sports. I have no doubt you could acquire these skills in other ways. But I learned them--and keep learning them--through fitness. If YOU are a closet member of the #museumfitness tribe, join us in bridging these divides. Take a five-minute pushup break in the office. Run up the stairs. Invite your colleagues to sweat along with you. Invite your gym-mates into your museum. And shoot a video for instagram. We'd love to have you as part of our team. Earlier this month, I went to a conference that renewed my faith in conferences. I first sensed the difference at the front door. There wasn't one. Instead, I walked into a lush garden in the middle of the city. Courageous speakers from dozens of countries described bold, participatory projects. Birds flew through the proceedings. The sounds of Spanish and English comingled as 800 delegates argued, danced, and envisioned el museo reimaginado. El Museo Reimaginado is a collaborative effort of museum professionals in North and South America to explore museums' potential as community catalysts. While I've been to conferences with this focus in many countries, El Museo Reimaginado is different. The Latin American delegates in Medellin reimagined change on a level beyond what I've experienced in other places. They were more committed. They were doing the work. They were coming together to celebrate and push forward. And the conference itself resonated with joy, participation, and community. It was an incredible event and I felt honored to be part of it. It seems that Latin American museums are more vigorously pursuing community-based work than institutions elsewhere in the world. I'm generalizing grossly here, but for the most part, I find European museums to be conservative. I find North American museums to be risk-averse. The Latin Americans I met in Medellin seemed way ahead of the rest of us. The delegates appeared collectively convinced of the value and power of community-based work. Everyone seemed to agree on two basic concepts: that museums should embrace community co-creation AND that museums can play significant roles in city-making. There were curators co-creating with prostitutes. Young guns making radical museum radio talk shows. Pioneers of communitario museums. Designers creating space for nationwide reconciliation and transformation. We met in Medellin--a city where cultural institutions were instrumental in turning crime and fear into hope and beauty. The examples were all around us, not just in the voices of speakers but in the physical sites where we met. It was refreshing and powerful to talk shop with shared community values as a starting point. The host venue was a living, breathing example of how museums can serve as community catalysts. Parque Explora opened ten years ago as a community development project. It offers a science center, aquarium, botanical garden, and lots of open plaza space in a marginalized neighborhood. Parque Explora's staff are deeply committed to co-creative, ambitious, community building work (read a bit about their community work here). It was amazing to see the diversity of visitors eagerly using the site from morning until night. Families playing, vendors hawking, students kissing, old ladies kibitzing. Even the conference itself was a model of social bridging. Big signs, public talkback walls, and open spaces made the conference porous to the community. One evening, there was a free outdoor concert of the Medellin Symphony as part of the conference. Every seat was taken--with conference delegates and neighborhood families sitting side by side. The conference delegates were geographically diverse and eager to connect. What a treat to learn together with people from so many different countries and contexts! The entire conference was simultaneously translated into English and Spanish. On most panels, it was common to have speakers from several countries. Each room was a diverse mix of voices, perspectives, and language. I heard fresh ideas, stories, and challenges in each room. I was continually hungry to learn more. The conference was joyful and full of energy. The sessions were smartly structured with different lengths and formats, ranging from panels to workshops to participatory performances to an intense "courtroom" in which co-creation was put on trial. But the energy flowed far beyond the sessions. The outdoor setting lent itself easily to side conversations, wandering from table to table, or breaking into conga lines (yes, it happened). It wasn't uncommon for a group to break into song, or for people to stand in spontaneous applause halfway through a presentation. Many delegates brought gifts. Instead of sponsors and trade shows, individuals handed each other trinkets and tshirts and catalogs. The closing event was a wild dance party. I lost my voice singing along to songs I don't know in a language I barely speak. The whole experience was exhilarating and deeply human. I felt like I made new friends in aggregate, a whole community of people who I look forward to seeing again. 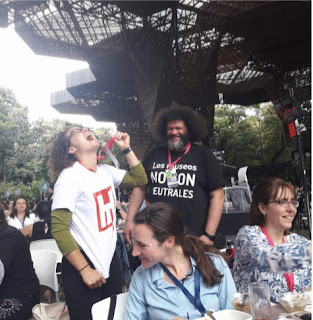 Muchas gracias to the organizers: Fundacion TyPA, AAM, and Parque Explora. I can't wait to go again--and I hope many of you will join me--at the next El Museo Reimaginado in 2019.